What if…there was something simple you could do to feel more confident and less fearful? What if I told you you can do this almost anytime and anywhere AND no one would know you were doing it! What if a huge group of us did it together, on the same days…think we could make a difference in the world? 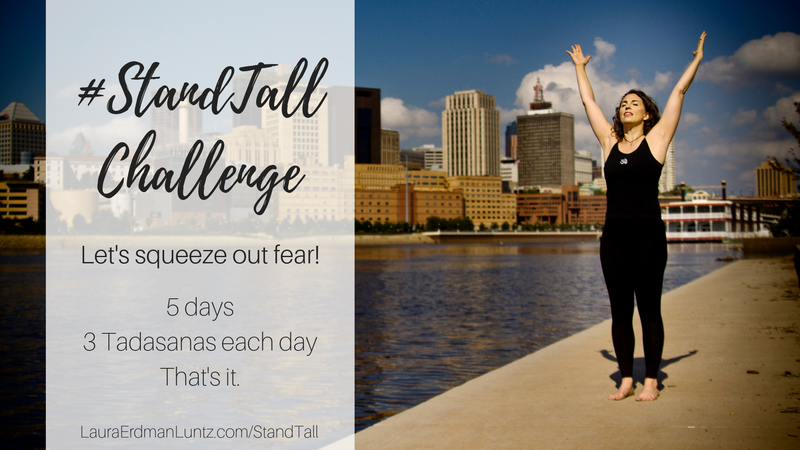 It’s time for another #StandTallChallenge! This series will squeeze out fear and bring on the umph in your life! I am challenging YOU to consciously take on a strong stand (Tadasana for the yogic-minded!) 3 times a day for 5 days! That’s it! I want you to stand tall and feel the power of it just a few times a day. Do this — a whole 15 times in a week — can really change your life. Commit to standing in a strong stance 3 times a day for 5 days, starting on Monday, October 1st. Each of the five days, I will be sending out a daily uber-quick video teaching you a super simple technique to make your pose stronger and more transformational. Yep, that’s it. Think you can do it? I KNOW you can! Ready to squeeze out fear? If you are ready, I am, too! Success! You're in! Check your inbox for your first step! Joining this challenge means you will be added to my main mailing list. You can totally unsubscribe at any time, but I hope you see it as an inspirational breath of fresh air in your inbox!